. . . for lung cancer the rate of lung cancer among the uranium miners is about five times of what should be expected if there were no risk at all. But nothing was published after 1988, and the next report appeared in 1992. But -- in this report it was always the old result of 1985, which was published. This means that it was obvious that the health authority of the Atomic Energy Commission does not want to publish the last result data of the follow-up. And the only reason we can deduce from that is that the situation of lung cancer and also other types of cancer should be a terrible disaster for the miners. 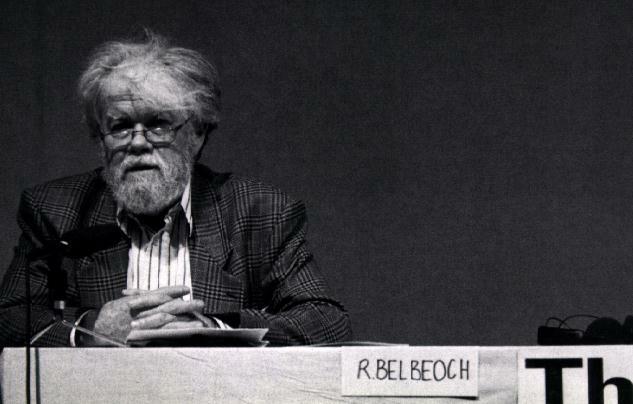 Prof Roger Belbeoch, France. Medical doctor, member of CRII-Rad (Commission de Recherche et d'Information Indépendante sur la Radioactivité). I am a physicist and I belong to a group of scientists in France for nuclear energy information. I want to talk about what we know about the cancer risk among the French uranium miners. For many years, the health authority of the Commissariat d'Energie Atomique, the Atomic Energy Commission who was in charge of French mines has denied that there was an occupational risk of cancer among the French uranium miners. They were constantly saying that the measures taken in French mines were so cautious that the cancer risk was much less among miners in France than in Czechoslovakia, Canada or the United States. The exploitation of uranium in France began early in 1947, and it was only in 1980 that a decision was made by the authority regarding a follow-up of mortality among the miners, the French uranium miners. The first official paper was published in 1984. It concerns the underground miners' work between 1947 and 1972. The mortality data were collected up to the end of 1983. Only a few details were available on this report, and it was impossible to have a good judgement about the veribility of this study. But it was published that the mortality due to the cancer of the lung was 1.9 times the mortality expected from the National Life Tables. The mean age of the miners at this stage of the follow-up was only 54 years, which is quite low for such a follow-up. This clearly means that the value of the lung cancer mortality was almost twice the national value, corresponding to the existence of the very serious situation of the French uranium miners. More precise results were published in 1988, and a court was consisted with 1,652 miners who started to work between 1946 and 1972 as a previous study. Many strange things are in these studies and reports, because from one report to another, some few hundred people disappeared or reappeared from time to time without an explanation. But what must be pointed out in this 1988 report, the mortality data were collected up to the end of 1985. The average duration of the followup was 26 years, which is too short to have a real state of the situation. The standard mortality ratio, the ratio of mortality for these miners, normalized to the average mortality of the French population was 2.4. That means that two more years added to the follow-up have increased the mortality of 30 percent, which is quite large. It was pointed out that the cancer of the larynx was about twice what was expected from the National Life Table. And also, the mortality by all causes of cancers, all types of cancers was about 30 percent larger than it was expected from the national mortality. But this report was not taking into account what is called the "healthy worker effect". This means that the workers -- especially in mines -- are selected before hiring by a very careful checkup from the health. So generally, they have a much better health than the population and it is expected that their mortality should be very much lower. From the data we have, we could suppose that this effect should affect the mortality by factor 2. So if we want to have the real situation, we must multiply this result by the factor 2, and this means that for lung cancer the rate of lung cancer among the uranium miners is about five times of what should be expected if there were no risk at all. But nothing was published after 1988, and the next report appeared in 1992. But -- in this report it was always the old result of 1985, which was published. This means that it was obvious that the health authority of the Atomic Energy Commission does not want to publish the last result data of the follow-up. And the only reason we can deduce from that is that the situation of lung cancer and also other types of cancer should be a terrible disaster for the miners. But what is the situation with the workers? The trade unions of the workers don't seem to be concerned with this occupational disease. And this is why the workers have no idea of the risk of their work and this increased the risk tremendously. Because if they don't know the effect of the radon, they can act in a bad way which increases the risk tremendously, even that the normal situation is not good enough. Now, there is a new thing about the regulation. Up to now, the miners have a special regulation what we call "protection". They were allowed to have a very much higher dose than all the radiation workers. And the official paper was always complaining about the recommendation of the ICRP, because applying this regulation would mean a very large increase in the cost of the uranium. And with the new recommendation of 1990 which decreased the permissible level for the workers there was a very strong protestation of the officials which they did not want to apply, because that would mean to close up most of the French mines. And what they ask for is a larger dose limit on the workers and to apply the official, for example, English result published by the National Radiological Protection Board, which means that about ten percent of the workers in the mines should be considered as to be killed by their work. And probably this estimation is lower than the reality.